A generation ago there were cheap rifles and expensive rifles and the performance difference between them was well defined with the more expensive rifles having the better performance. Generally the less expensive makes included J.C. Higgins and other retail store brands. Some were imports marked with a big name brand. The author found the Savage Axis II XP a clean design with much to recommend. The first edition of the Axis rifle did not incorporate the Savage AccuTrigger, an important modern innovation. The AccuTrigger features a lever insert into the trigger face that blocks the sear unless fully depressed. The AccuTrigger may be adjusted to a crisp and light trigger action while the safety lever makes for a greater degree of safety. Savage pioneered the lock nut method of securing the barrel to the receiver. This is an inexpensive means of fitting the barrel but it also results in good tolerances and good accuracy for a mass-produced, bolt-action rifle. 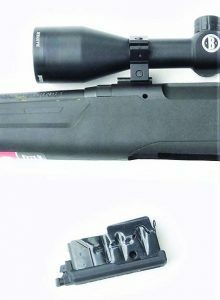 A detachable steel magazine provided good feed reliability. The black synthetic stock features pillar bedding. Pillar bedding was once an expensive and labor intensive process. The stock is ergonomically designed and makes for excellent handling. The stock fits most shooters well with a length of pull of approximately 13.25 inches. The recoil pad offers good recoil control. My example is chambered in .308 Winchester and features a 22-inch barrel. The detachable steel magazine holds four cartridges. The rifle is light enough at 6.5 pounds without a scope and just under eight pounds with most 3x9x40mm rifle scopes. 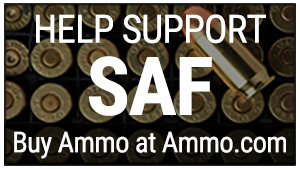 The balance is more important when firing offhand than when testing the rifle on a bench rest. The Savage Axis II handles quickly and the stock is an aid in fast handling. The rifle comes to the shoulder quickly and is easily held steady. The rifle may ship with different scopes but my personal rifle, purchased in August 2018 from South Carolina Gun Company (SCgunco.com; phone: 864-334-5151) features a Bushnell scope. The Bushnell Banner Dusk & Dawn 3 x 9 x 40mm rifle scope features coated lenses in order to increase focus, sharpness and clarity. From my testing the Dusk and Dawn scope lives up to its promise. The scope is shock resistant and fog and waterproof. The scope reticle features hold over hash marks that work well in practice. The rifle features easily adjusted turrets. The Bushnell Banner is a very popular scope and one that has proven useful and durable in use for many years. It is inexpensive but the Dusk & Dawn scope isn’t a cheap scope. The well designed stock proved a good fit for most shooters. I sighted the rifle in at 50 yards, and then fine turned it at 100 yards using the affordable American Eagle FMJ load. I continued to use this loading in firing offhand at small targets on the 100-yard berm and a steel pepper popper. I was rewarded with the pleasant ring of a steel gong absorbing over a ton of energy with every shot. If the shooter is careful and presses the crisp AccuTrigger properly a hit comes easily. Firing off the bench rest I used what I feel is among the finest modern .308 Winchester loads available. 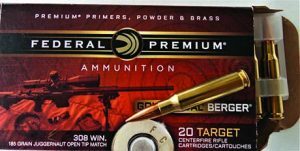 The Federal Cartridge Company Tactical 168-grain Match-tipped load is one I keep on hand for use in the M1A1 rifle. This was the first load up for accuracy testing. Three 3-shot groups were fired at one hundred yards. The smallest group was 1.2 inches, the largest 1.8 inches. The rifle is clearly accurate enough for field use. The Federal Cartridge Company 180-grain Berger Match is a super accurate long range loading. I also used the Federal MSR, a load I keep on hand for use in AR type .308 rifles. This 150-grain load averaged less than two inches for three shots. I also tested a very interesting load which I had been waiting to find a good bolt action rifle to test it in. The Federal 185-grain Juggernaut uses a custom match grade bullet from Berger bullets. Recoil was increased due to the bullet weight but accuracy was good. The rifle never failed to feed, chamber, fire, or eject and proved accurate with bullet weights from 150 to 185 grains.